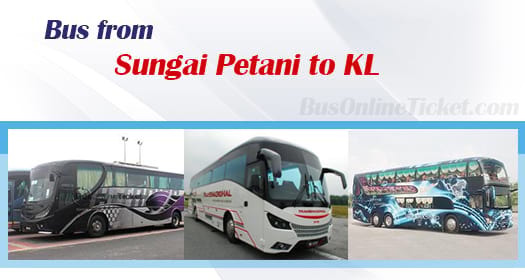 Bus from Sungai Petani to Kuala Lumpur is one of the important bus services to connect residents between Sungai Petani and Kuala Lumpur. Many locals especially working adults and students prefer to take bus from Sungai Petani to Kuala Lumpur for work and study. The main reason why this bus service is popular is because the bus schedule from Sungai Petani to Kuala Lumpur is frequent as compared to ETS train. Moreover, there is no direct flight service for this route. Eltabina Express, Transnasional, Plusliner, Sri Maju, Super Nice Grassland Express, and Antar Holiday are few bus operators that provide bus from Sungai Petani to Kuala Lumpur. Transnasional is the dominant player for this route by having up to 13 daily departures. Sri Maju is another famous brand serving this route. The earliest bus leaves the bus terminal in the morning at 8:30am while the last bus leaves the bus terminal at night 11:59pm. Bus from Sungai Petani to Kuala Lumpur takes approximately 6 hours, depending on the road traffic and weather condition. At least 1 washroom break will be given. Additional washroom break will be given upon request to the bus driver during the journey. The bus fare for this trip is in a range of RM 38.70 to RM 45.00 depending on your choice of bus operator. Bus from Sungai Petani to Kuala Lumpur will pick up passengers at Sungai Petani Bus Terminal. Upon reaching Kuala Lumpur, the bus will drop off customers either at Terminal Bersepadu Selatan (TBS) or Hentian Duta Bus Terminal. From there, passengers could take public transport such as taxi, intercity bus, LRT or KTM to their next destination. BusOnlineTicket.com is a one-stop portal providing online booking for bus ticket with instant confirmation. Online payment can be made with either credit card or internet banking. It is a simple and easier way to book bus ticket online for everyone no matter where you are.